Yes, you heard me. Let it go. Dropping your medical insurance is one of the most potent things you can do to protest how the system is set up. It's also a powerful step toward taking full responsibility for yourself as a human being, starting with your physical health. Here's the Sitch This may be news to you: the conventional "treatments" your insurance covers generally only make you sicker—sometimes in the short run, but almost always over the long haul. 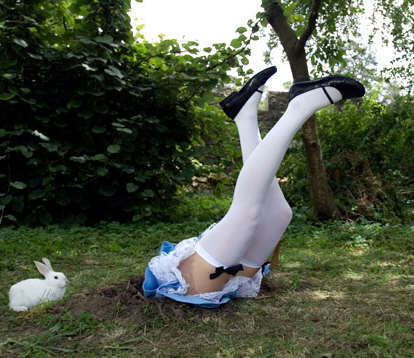 Uh, Alice? I'm not going to go too far down the rabbit hole with you here, but suffice it to say that there are billions of dollars at stake in keeping you sick, fat, broke, and ignorant. Our entire medical industry is set up to accomplish that deadly triple purpose brilliantly. If you doubt me, just follow the money. Here's an example. Which would you tend to believe? 2. That fluoride is a dangerous toxin that does not belong in our bodies except in the extremely minute amounts available to us through natural mineral-rich foods and water? This is the viewpoint of the broke, passionate, grassroots nonprofit Fluoride Action Network. If you're still undecided, I'll just ask you this: who has more to lose if you decide fluoride has no place in our water supply? The ADA and ALCOA? Or the Fluoride Action Network and its thousands of moms, dads, and conscious public servant members? "Let Food Be Thy Medicine"--Hippocrates Now, what if you took the money you spent on "health" insurance and used it instead to buy locally grown, free-range, organic produce and meat, along with a few key supplements? 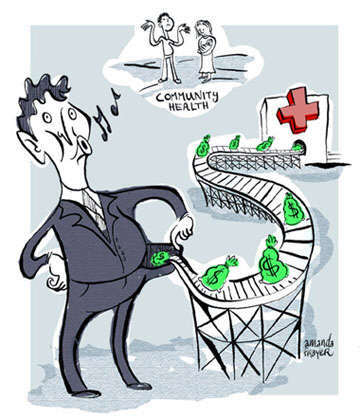 In 2009, the average American family spent around $13,000 a year to ensure it could have access to radiation, antibiotics, chemo, vaccines, painkillers, surgery, drugs, and other treatments of questionable benefit. That's about $1,083 a month. Think you could afford some good food with that? OK, so say you're really going to consider this idea. You're really tempted to give up your monthly fee for treatments that you don't even believe in and may not use. You're ready to make the leap. Health Begets More Health And then you think, "Wait, what if I fall off a cliff on that trip to Tanzania in the spring?" I asked myself that question, too. How do accidents fit into the grand scheme of independent health? Here's what I think: When you're healthy and vibrant and fit and functioning like a well-oiled machine, you're so much less likely to have an accident! And if you do, you should know, like our recent ancestors did, how to set a bone, how to suture, how to tie a tourniquet, how to use medicinal plants to heal yourself and your family, etc. The information's all over the place. No reason you can't learn how. I'm working on it myself! Here's another objection to my argument, on the more esoteric side, as addressed by Abraham, one of my favorite inspiration sources. A guy asked Abraham in a sort of belligerent way (which you often see in people arguing heroically for their perceived limitations), "Well, how come we can't grow a new arm, then?" There was a pause, and then Abraham replied simply, "Because you believe you can't." In the interest of full disclosure: the antibiotic azithromycin saved my life from pneumonia in 2004 after my honeymoon in Costa Rica. So how do I reconcile that with my handy-dandy medical insurance-less existence? I got pneumonia after staying up all night preparing for a wedding to a man with whom I knew I was ill-suited to spend my life. Good man, turned out to be a great dad to our son, but not right for me. See where I'm going with that? It's all about taking ultimate responsibility for yourself. We've been trained to do the opposite, and now many of us are stuck in passive victim mode. Unplug from the medical industrial system. It really doesn't serve you, and exists only to perpetuate itself. Take back your power and start living life as you were meant to live it—free, healthy, independent, and strong! It's never too late. I'm taking some flack on this from people (the anger is what I've come to expect when I bring up radical personal responsibility) with concerns about accidents and how it's important at least to have some kind of insurance for emergency care. What I want to convey, and perhaps I should've gone further down the rabbit hole in my post to explain this, is that we won't be able to count on insurance of any kind AT ALL in the very near future because of powerful economic and political factors currently in play. In particular, Medi-Cal/Medi-Care are not viable options in the long-term for those with low incomes who cannot afford insurance. My post was meant to instill a sense that it's time we all become completely self-sufficient and stop relying on the government to provide for us in any way, shape, or form. To depend on this crumbling, broke, corrupt, and inept system is far riskier, in my opinion, than going without Medi-Cal. I suggest making friends with a surgeon or doctor, or better yet learn how to treat wounds and injuries yourself, stop eating sugar and processed food (anything in a box, can, or bag), get fit, and take responsibility for your own health and your family's. My message is as simple as that. Now, having said that, if my kid broke his arm, would I take him to the emergency room? Of course I would! Here's my point, though: What if I COULDN'T? What if it was filled with hundreds of other injured people seeking care? What if it was closed? What if the doctors left? What if I couldn't even get to a hospital in the first place? See my point? All I'm advocating is self-sufficiency. We've been encouraged to rely completely on a system that's about to shut down. How are you going to respond? I'm still getting some blow-back from folks who say they have to have insurance, or what would've happened to Granny in '01 when her ticker started to give out, and do you think we should've just gone bankrupt because Johnny needed ACL repair after that tough fourth quarter last fall? Anyway, that little stint in the hospital cost $16,000. That's sixteen thousand dollars. Would I pay it all over again if I had to? Of course. Did we have insurance? Yes! Did we have to fight BlueCross for every single f---ing nickel and dime of it? You bet. Took six months of heavy paperwork as I nursed my newborn, gave him his antiseizure medicine, cried, and prayed hard for his full recovery. Years after that, even as Cisco was entering kindergarten, we were still getting harassing calls from providers and insurance people alike insisting that we pay more toward the hospital bill although we had been "fully covered" under our policy. What would have happened to Cisco, and Granny, and Johnny if they hadn't been insured? Would they have received treatment? That's all I'm asking you to look at. And I'm asking you to consider helping me to find a way to end our dependence on a very shaky, very corrupt, and very ineffective system that was supposed to protect and serve us, but which has been co-opted by forces that do not give a damn about any of us. Do individuals within the system work hard to take good care of people and do the best job they can? I have no doubt about that. Are they severely hampered by rules, regulations, bottom-line thinking, and the systemic enforcement of mediocrity? I think you can guess the answer to that. In closing, I'm posting a link to a new kind of doctor who's completely bucking the insurance-ruled medical industry and returning to her original purpose in wanting to become a doctor: healing people. Wow, that's radical in these times. A friend also alerted me to a new kind of health-care paradigm that I find very hopeful and fresh. Perhaps we can begin to find a solution through such "renegades" by encouraging them through our own willingness to take responsibility for our health, rather than giving our power away to entities that see Cisco, Granny, and Johnny only as dollar signs. We cannot count on faceless, inhumane, bureaucratic institutions to protect us from danger, discomfort, or disaster. We must begin to rely on ourselves and each other, as we've done for millennia. There's no reason to return to the Stone Age--let's use our brilliant surgeons, our incredible technological advances, our understanding of our Earth to create a future that serves us, rather than oppresses us. Many blessings to you as we ride the wave of this intense energy into 2012! Long live truth, beauty, and love! PS: Here's Dr. Wasson's Facebook page if you want to send her some love and encouragement. It's not easy to buck the trend, and she's out there on the leading edge of a new, better version of humanity.